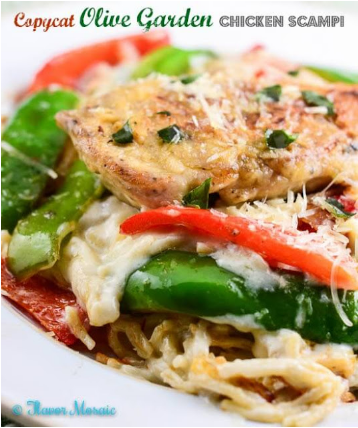 Copycat Olive Garden Chicken Scampi is my homemade copycat recipe of Olive Garden's popular Chicken Scampi dish with sautéed chicken breast, onions, and bell peppers served over pasta with a creamy garlic white sauce. Place flour into a shallow dish. Stir in salt and pepper. Dredge chicken in the flour, then in milk, and then again in the flour. Set chicken aside. While the chicken is resting, chop onions and the red and green bell peppers. In a large skillet over medium heat, add 1 tablespoon each of butter and olive oil. Add the red and green peppers, and onions and cook until the onions are clear and the peppers are softened and starting to brown. Remove from skillet. In the same skillet add a tablespoon each of butter and oil. When hot, add the floured chicken. Cook for about 5 to 7 minutes, then turn the chicken and cook for roughly another 5 to 7 minutes. Remove chicken from pan. Add a tablespoon of butter, then add garlic and stir for about 1 minute. Stir in white wine and italian seasoning, scraping the bottom of the pan while you stir. Remove from heat. Stir in parmesan cheese into the sauce. Return the cooked onion and peppers to the pan and stir. Add the pasta and vegetables on each serving plate. Top each plate with cooked chicken. Garnish with chopped basil and shredded parmesan cheese. 0 Response to "COPYCAT OLIVE GARDEN CHICKEN SCAMPI"